Kare-kare is a Philippine food made from peanut sauce with a variety of vegetables, stewed oxtail, beef, and occasionally offal or tripe. Meat variants may include goat meat or (rarely) chicken. It is often eaten with bagoong (shrimp paste), sometimes spiced with chili, and sprinkled with calamansi lime juice. 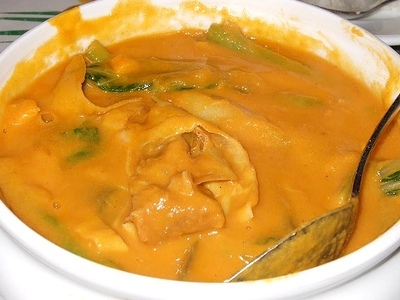 Any Filipino fiesta, particularly in the Tagalog region, is not complete without kare-kare. In some Filipino-American versions of the dish, oxtail is exclusively used as the meat. The combination of a beef, tripe, and vegetable stew cooked in peanut sauce and the pungent fermented shrimp paste (bagoong) that is considered as an integral part of the dish (bagoong is always served with kare-kare), must seem particularly bizarre to non-Filipinos; yet it is one of the ultimate comfort foods for Filipinos worldwide, and is a perennial family favorite in both local and overseas Filipino households.